Auchentoshan American Oak is a popular Whisky available from Tesco Groceries in 70cl to buy online. Visit Tesco Groceries for the best price for 70cl of Auchentoshan American Oak or compare prices on our other Whisky products. Triple distilled and matured solely in American bourbon casks. The result: a Lowland Single Malt Whisky with the sweet aromas of vanilla and coconut - along with the signature smooth, delicate, Auchentoshan taste. To The Eye: Bright gold. To The Nose: Bourbon vanilla and coconut with layers of zesty citrus fruit. To The Tongue: Refreshingly smooth yet lively with vanilla cream, coconut and white peach. To The End: Crisp with sugared grapefruit and a hint of spice. Where to buy Auchentoshan American Oak ? Auchentoshan American Oak Supermarkets & Stockists. 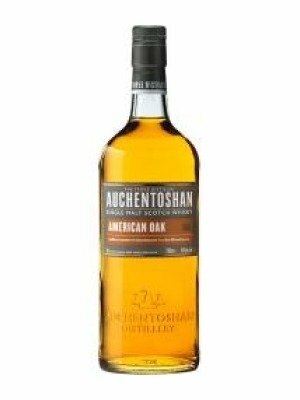 You can buy Auchentoshan American Oak online in most retailers and find it in the Whisky aisle in supermarkets but we found the best deals online for Auchentoshan American Oak in Tesco Groceries, Amazon.co.uk, TheDrinkShop, Waitrose Cellar, DrinkSupermarket.com, and others. Compare the current price of Auchentoshan American Oak in 70cl size in the table of offers below. Simply click on the button to order Auchentoshan American Oak online now.